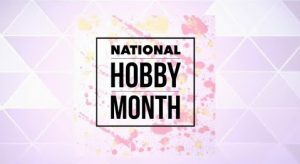 January is National Hobby Month, and there has never been an easier time to pick up a new skill to enjoy. Thanks to a wide range of digital tools and online communities, learning a hobby is more accessible than in the past. Consider choosing a hobby that helps you remain true to your New Year resolutions. If you are able to take up something you enjoy, those lofty aspirations may be easier to keep. If your focus was on health and fitness, consider taking up Zumba or jogging. Perhaps you want to stress less: yoga or knitting could be the hobby for you. Did you promise to keep a better hold of your finances? Try a money saving hobby such as cooking, reading, or gardening. There are many beneficial reasons to have a hobby. Not only can a hobby help you relax, but it can help you structure your time. Hobbies can create new social connections, and help make you a more interesting person. Even the challenges that a hobby might bring can be a good thing. By being challenged in an unconventional way your confidence may be boosted and burnout in other areas of your life may be lessened. A hobby is a great way to bring balance to your world. It is an excuse to do something just because you want to do it. When you’re ready to get started, an easy first step is to find online how-tos. In the past, gaining expertise in order to learn about a hobby could be cost prohibitive and difficult to find. While there are still some hobbies that may require in-person instruction, e.g. skydiving, sites such as YouTube, Pinterest, and Reddit may be a good start for many beginner hobbyists. Different experts may have different techniques or presentation styles, so don’t hesitate to find a tutorial that works for you. Joining a hobby doesn’t necessarily mean that you need to deal with experts, there are many benefits to joining online communities as well. Engaging with people in your same interests can be a fun and new way to learn about your hobby. Use this list of hobbies to find tutorials to get you started and online communities to join.